This molecule is biotinylated at the unique C-terminal cysteine using a maleimide-biotin reagent. This product is a recombinant protein produced in E.coli. Affibody® affinity ligands are unique research reagents, produced using innovative protein-engineering technologies. They are small, simple proteins composed of a three-helix bundle based on the scaffold of one of the IgG-binding domains of Protein A. Protein A is a surface protein from the bacterium Staphylococcus aureus. This scaffold has excellent features as an affinity ligand and can be designed to bind with high affinity to any given target protein. The domain consists of 58 amino acids, 13 of which are randomized to generate Affibody® libraries with a large number of ligand variants. Thus, the libraries consist of a multitude of protein ligands with an identical backbone and variable surface-binding properties. In function, Affibody® Molecules mimic monoclonal antibodies. Compared to antibodies, the most striking dissimilarity of Affibody® Molecules is the small size. Affibody® Molecules have a molecular weight of 6kDa, compared to the molecular weight of antibodies, which is 150kDa. In spite of its small size, the binding site of Affibody® Molecules is similar to that of an antibody. The advantages of Affibody® Molcules over antibodies are: -their small size -the simple structure of the molecules -its robust physical properties; able to withstand a broad range of analytical conditions, including extreme pH and elevated temperature -its ability to fold correctly intracellularly -the fast and cost effective production in bacteria -the potential to couple Affibody® Molecules in multimeric constructs Affibody® Molecules have highly competitive properties for applications within affinity purification, sample preparation, protein detection and in vitro diagnostics. Shipped at 4°C. Store at +4°C short term (1-2 weeks). Upon delivery aliquot. Store at -20°C long term. Store In the Dark. The purity of this product is >98% as determined by RP-HPLC analysis. Our Abpromise guarantee covers the use of ab31890 in the following tested applications. Staining of paraffin embedded tissues is not recommended. AFFIBODY® MOLECULES ARE PROTOCOL SPECIFIC. PLEASE REFER TO THE "PROTOCOLS" SECTION. Cells of the human mammary gland cell line SK-BR3 were stained with biotin conjugated Anti-ErbB2 Affibody® molecule (ab31890). The staining was localized to the membrane of the ErbB2 expressing human mammary gland cells. Nuclei were counter stained with DAPI (blue fluorescence). 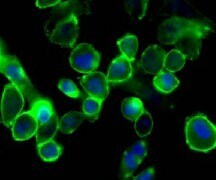 The SK-BR3 cells were stained for 30 minutes at a concentration of 1-5ug Affibody® molecule/ml. Publishing research using ab31890? Please let us know so that we can cite the reference in this datasheet. Thank you for your answer. I would like to receive , if possible, an offer with 5 % of discount for ab40048. Please use the code 5PC-OFF-T7T62 to get 5% discount when ordering the protein online. Thank you for your answer and suggestions. I decided to order protein ab40048 and I would like to know if it possible to have a test sample or a discount for test the protein. Unfortunately we do not provide free of charge samples. However in order to help our customers we provide Abtrial programme (https://www.abcam.com/index.html?pageconfig=resource&rid=11998&viapagetrap=collaborationdiscount). The abtrial is possible in case of ab40048 only if you are interested in using this protein in applications other than ELISA, Inhibition assay, SDS-PAGE and WB. The Abtrial will provide you your next product free of charge if you buy and test ab40048. I have ordered ab31890 biotin-affibody. Could you suggest me an erbb2 protein compatible with this affibody? We have ErbB2 proteins available however we haven't tried these with ab31890. I am sorry we will not be able to suggest the compatible product however technically the affibody should work with these proteins. I wish to use this molecule to probe for my ErbB2 mutant, and am wondering if the epitope of the affibody would be within 100 amino acids of the missing region. The missing region is aa 634-649. Thank you for your enquiry. We have not yet mapped the binding site of the Anti-HER2 Affibody molecule on the HER2 receptor. However, it was raised against the whole extracellular part of HER2 and may therefore bind to any of the four extracellular domains. We do know that the Affibody binding epitope is distinct from Herceptin's (Trastuzumab) since Trastuzumab and Anti-HER2 Affibody molecule do not block each other's binding. I am sorry that we couldn't be more specific at this time. We will probably do some mapping in the future.